Provide comfort for the family of James St. John with a meaningful gesture of sympathy. 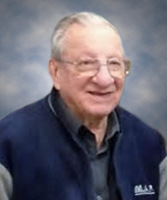 On February 7, 2019, James St. John of Camrose passed away at the age of 87 years. James is survived by his children, Ron (Lisa), Janice (Joe) and Wayne; ten grandchildren, Missi, Constance, Rachelle, Denean, Robyn, Thom, Brad, Dakota, Dylan and Dawson; and several great-grandchildren. Predeceased by his wife, Kay; daughter, Kim; parents, Vern and Millie; brother, Joe; and sister, Pat. A Celebration of Life will be held at a later date. Cremation has taken place. In lieu of other tributes, donations may be made to the Heart and Stroke Foundation of Alberta, NWT & Nunavut, Suite 144, 5241 Calgary Trail NW, Edmonton, AB T6H 5G8 or the Alzheimer Society of Alberta & NWT, 10531 Kingsway Avenue, Edmonton, AB T5H 4K1.